Volunteers in Sandwich, Massachusetts, waded into a pond last Saturday with "thumping" poles, in search of gravestones supposed missing from the adjacent Old Town Cemetery. George Burbank's 1946 book Highlights of Sandwich History says that ne'er-do-wells tossed the stones into the pond back in the 1880s. In December, town workers pulled a headstone of Hannah Thacher, who died in 1785, from the water. Town workers found the headstone and other broken pieces of stone in shallow water when they were clearing bramble and brush between the pond and the cemetery. 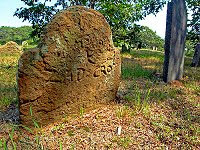 Some believe Burbank's tale of graveyard shenanigans is accurate because while the burial ground was established in 1663, according to historical records, the oldest stone in the cemetery is marked 1685. There are other possible explanations for the gap. In his study of colonial gravestones on Cape Cod, Stephen P. Broker was able to locate just 37 stones bearing dates prior to 1709.